In response to a question posed to me, this post will compare the similarities and differences between two of my favourite species – two beautiful, large, wild cat species – the Cheetah and the Leopard. The Cheetah has black lines running from the tear duct down to the top jaw, at the edge of the mouth; also a thinner black line/ spots running from the outer edge of the eye, over the cheekbone, and down to the neck. Small spots dabble the head and face, with a pale and plain bottom jaw and neck. No spots in between the eyes, above the nose. Small, oval ears and a small, black nose. The Leopard has big, round eyes lined in black. Odd shaped spots cover the whole face and head; except between the eyes, above the nose. Nice, round ears; nose can be black or pink. Now, the Cheetah has small, round, full spots. The Leopard, on the other hand does not have full spots; except on the head and face. The Leopard has (almost) loops with darker fur filling the middle, and sometimes a small spot at the centre too… this is called a rosette. Cheetahs do not roar, but rather have a range of other vocalisations, such as; purring, growling and a variety of chirping calls. Leopards will growl, and purr – however they also have various other kinds of vocalisations including a ‘rasping cough’ vocalisation, to make their presence known to other Leopards. Cheetahs typically have 3 cubs in a litter. A Cheetah mother will leave their cubs to hunt, before returning to their solitary lair to nurse. Cubs will stay with their mother, learning from her until they are 2-3 years old. Leopards tend to have 2-3 cubs in a litter. A mother Leopard will not wander from her territory after giving birth, until their offspring are old enough and capable enough to accompany her. Cubs will stay with, and learn from, their mother until they are 2 years old. Cheetah females raise the young alone, with no input or help from the males. Leopard males do not help with raising the young either; however they do patrol the territory and provide security for the female and their cubs, from rival males. Cheetah males will live in small groups of 2-3 as adults; often brothers. Female Cheetahs are solitary as adults. Leopards of both genders are solitary throughout their adult life. Cheetas have a wild lifespan of 10-12 years. Leopards have a wild lifespan of 12-14 years. Cheetahs live in sub-Saharan Africa, north Africa, south Africa, East Africa, and Iran. 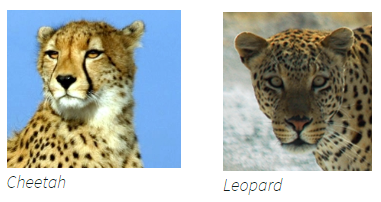 Cheetah subspecies – African Cheetah, and Asiatic (Iranian) Cheetah. Cheetahs are of the same colouration. 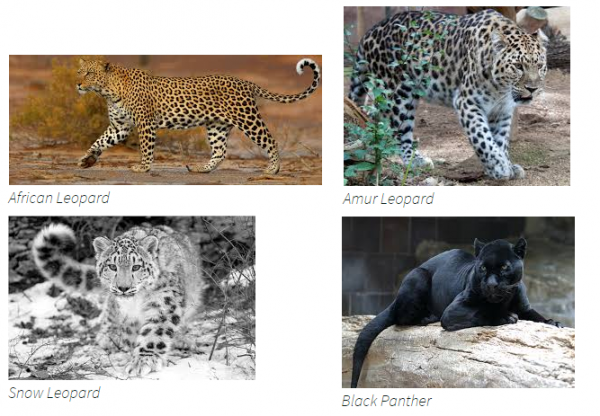 Leopard subspecies – Amur (Asian) Leopard, African (Indian) Leopard. Leopards range from the standard colouration, to the paler Snow Leopard, and the Black Panther (a Leopard with dark black rosettes on lighter black fur). Cheetah – the fastest land mammal. Reaching speeds of up to 75 mph! However Cheetahs are sprinters, which can make hunting difficult; after the sprint of energy (of approx. 20-60 seconds), the Cheetah soon tires – so they must hope for a successful hunt! Cheetahs will devour their kill as quick as possible, as they will back down easily if challenged for it. Leopards can reach speeds of approximately 35 mph – however they tend to make a kill by stealth rather than speed. Leopards often drag their kill up into trees to prevent other carnivores from stealing it. Both species are brilliant, awesome creatures (in my opinion) – unique in their own ways, surviving the wilderness each day in their own way!